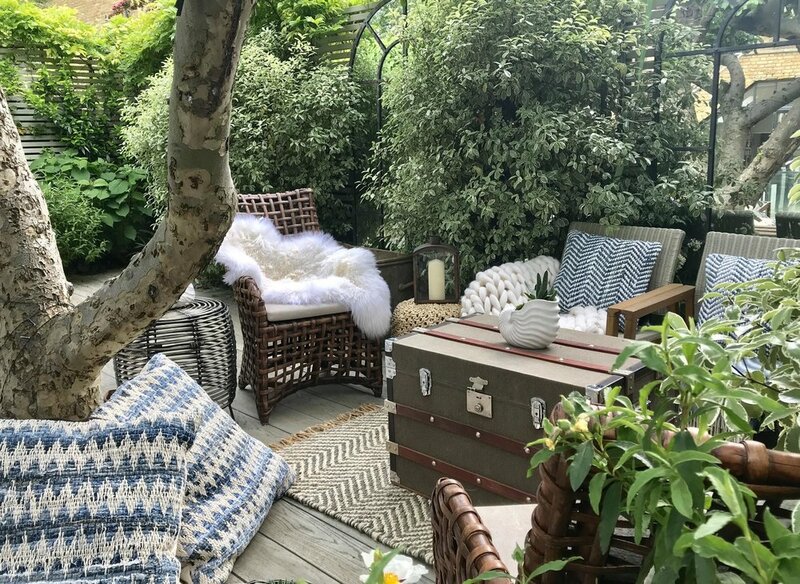 In the spirit of the Chelsea Flower Show, we decided to style up an outdoor space to give you some practical tips and suggestions on how you can do the same to your outdoor space. Starting with the space and using the plants and trees as inspiration, we added lots of texture, pattern and natural materials. We love the idea of an outdoor-indoor oasis and so we used cosy and warm accessories to ensure that the space was very comfortable to be in. We used a piece of faux grass as a “rug” outside to help cover up some very old flagstones which was very effective and a flash of green could be seen from when you entered the house which is always very appealing. Mirrors always work well and trick one into thinking the space is larger than it really is. Use them liberally for maximum effect. Your property needs to look fabulous from the moment the buyer sees it and this starts before they walk through the front door. Remember, the first impression is always the most important. Grab them at the beginning and gain the upper advantage. Give the front door a fresh coat of paint, tidy up the front garden by cutting the grass, weeding the beds and any stone walkways. Don’t forget to clean the windows! These little changes can make a big difference to a buyer’s impression of a property and you’ll reap the rewards to your efforts. It’s no secret that flowers can make all the difference to a home. They’ll brighten up a room and add a sense of character along with warmth and freshnes. They also serve as positive focal points for marketing photographs. Faux flowers can be hugely useful and considerably cheaper when prepping a home for market. They’ll keep looking good forever so there’s no need to keep changing those vases! When we’re using flowers in our staging, we like to use faux flowers and often stick to hydrangeas and orchids which add an elegant aura to a space. Single stem ferns, mossy twigs, banana and palm leaves add a sculptural element that compliments the more delicate floral parts of an arrangement. Succulents are also interesting to work with. Elegant, relaxed and a lovely way to add a little greenery to any setting. Potted succulents add a particularly welcoming feel. When it comes to arranging, keep it simple, stick to one or two colours. Feel free to use a variety of vases in different materials such as glass, ceramic and metal or go for wicker and rattan to keep things natural. Flowers, greenery and a well kept garden can do wonders for a buyer’s mood. Lift their spirits and they’re more likely to make you an offer! Don’t skimp out on these areas as you need to do everything you can to boost your chances in today’s property market.